Viva Zapata! 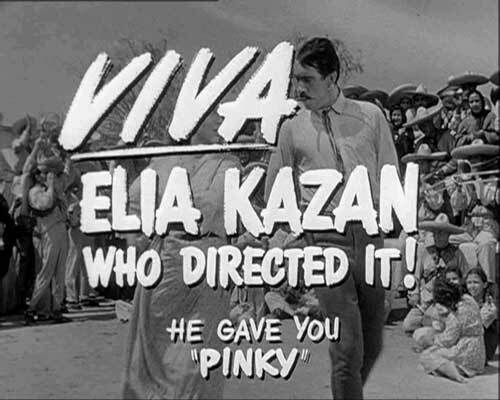 is a 1952 biographical drama film directed by Elia Kazan. 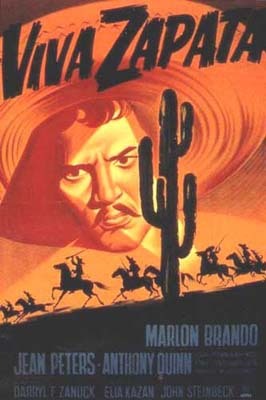 This fictionalized film of rebel Emiliano Zapata (Marlon Brando) follows his life from his peasant upbringing, through his rise to power in the early 1900's, to his death. Zapata was joined by Pancho Villa (Alan Reed) in his rebellion against tyrannical President Porfirio Diaz. Academy of Motion Pictures, AMPAS (1952) Won: Academy Award for Best Supporting Actor, Anthony Quinn. Academy of Motion Pictures, AMPAS (1952) Nominations: Best Actor in a Leading Role, Marlon Brando; Best Art Direction-Set Decoration, Black-and-White: Lyle R. Wheeler, Leland Fuller, Thomas Little, Claude E. Carpenter; Best Music, Scoring of a Dramatic or Comedy Picture: Alex North; Best Writing, Story and Screenplay: John Steinbeck. The phrase "Viva Zapata!" is also used in times of protest by who face injustice. The shout is often accompanied by "Tierra y Libertad"
Filming locations: Durango, Colorado; and New Mexico. The film tends to romanticize Zapata and in doing so distorts the true nature of the horrific wars he waged. Still, Zapata did fight - not to conquer Mexico but to free the land for the peasants of Morelos and the other southern Mexican provinces. There is also a book titled Zapata by John Steinbeck. The original screenplay was written by the author and the book contains a newly found introduction by Steinbeck, the original proposed screenplay, and the official movie script.